It was raining in Waterford. Ha. Ha. Ha. Unfortunately, I can’t blame the name for calling down the rain since it is an Anglicization of the Norse vedrafjordr, or “ram’s fjord.” I also can’t blame the Irish name, Port Láirge, which officially means Lárag’s Port but sounds suspiciously like a reversal of longphort (a port in Ireland for—what do you know?—Viking long ships). Anyway, now I think I know why the old woman from Wexford tried to kill her husband…But I’ll come back to that later. I caught the 4:40 bus out of Cork on Friday evening and arrived in Waterford in the dark. Since I didn’t know where my hotel was (and I had conveniently chosen one 5.6 kilometres from the bus station), I hailed a taxi cab and arrived at the Ramada Viking Hotel relatively dry and warm. Friday night was thoroughly uneventful, unless one counts my first hot bath of the semester as an event. Saturday was far more exciting in the tourism department. I walked the 5.6 kilometres back to the city centre, and along the way I had the chance to truly appreciate Waterford’s history. It is the oldest town in Ireland and was founded by the Vikings in the 9th century, though some will claim that it was founded in the 2nd century or in prehistoric times. 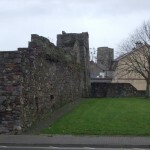 While most of the cities around here have remnants of some sort of medieval wall and, of course, old churches, Waterford’s wall is predominantly intact and includes some watchtowers perched right beside the main road. Not only that, it is one of the few cities in which traces of the Vikings are present, obvious, and in side-by-side existence with Middle Ages architecture. One such example of Viking construction is Reginald’s Tower, which sits right at a busy intersection and has become a Viking museum. Because everyone needs a midden heap. This was in the dinery. Christ Church and then led to the third floor. The museum was complete with city layouts through the ages, wax figures modeling medieval garb (and what a shock it gave me to turn around and find myself face-to-face with a king! ), charter books and royal decrees printed on vellum, swords, medieval art, bishops’ raiments worked in cloth-of-gold…The list goes on. I don’t want to bore you with descriptions of museum interiors, so I will cut it off with two notes. For some reason, the museum felt it necessary to display the wax heads of three rebels on pikes. Three highly realistic heads. Historical? Yes. Aesthetically pleasing? On the vomitous end of the spectrum. Second, Waterford has a long record of rebellious attitude. For instance, it was really the only city in Ireland to successfully resist Oliver Cromwell. 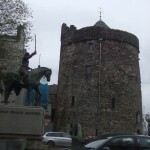 The man besieged Waterford fruitlessly and was eventually forced to withdraw in 1649. Don’t get too excited, though; the city fell to his deputy in the same year. on to the Viking Museum in Reginald’s tower. Since the Vikings are not noted for their artistic ability, the collection consisted primarily of pins, arrowheads, swords, and some pottery shards. 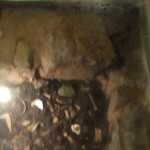 The tower itself has as much of a story as the artifacts within. In its day, it served not only as a watchtower but also as a royal mint and a prison. 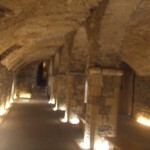 During its life as a gaol, it was damned for its discomfort; the government didn’t see fit to update damp, drafty medieval construction for the benefit of criminals. The female prisoners held on the third floor kept warm and stayed cheerful by dancing jigs and reels.To this day, the tower is still a bit drafty despite being equipped with electric lights and heating, and its winding stairs have been resurfaced but not redesigned for the modern human. I had to keep my head low as I climbed, and I nearly brained myself on several eye-height lintels. Irish nationalist and was originally condemned to death by the English; instead, he was deported to Australia. From there, he made his way to New York City, studied law, worked as a journalist, and joined the U.S. Army to fight in the Civil War. Then, he was appointed governor of…Can you guess? And the answer is: the Montana Territory! Unfortunately, he fell off of a steamboat in Fort Benton and drowned in the Missouri River in 1867. My last stop for the day was, of course, at Waterford Crystal. The store would have been unmistakable even if I hadn’t seen the name. Glass-fronted and glittering with lights, it stood out for blocks around. Inside was a plethora of beautiful crystal that I might return to buy after I’ve made my first billion. I made one purchase that will hopefully show up at home before Christmas. Then, I headed back to the hotel, stopping for a sandwich at a convenience store since my checkbook was wincing. I felt a bit guilty spending any money on a nice dinner! 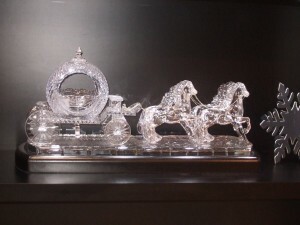 Waterford Crystal: Things I want but cannot afford, part 1. This one is priced at about 12,500 euros. 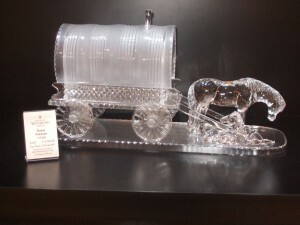 Waterford Crystal: Things I want but cannot afford, part 2. This one had no price posted. I don't want to know. I am still allowed to drool. The dry weather—and, for that matter, the light rain—was over by Sunday morning, and the monsoon had begun. I headed for the bus station in a taxi. I purchased a ticket to Wexford and then had time for coffee and a pastry before the bus left. When I arrived in Wexford, it was raining, if possible, even harder. In desperation, I stopped at Dunnes to buy a nice, stout umbrella. Then, I went in search of a bed and breakfast where I could perhaps leave my backpack, but forty-five minutes of wandering left me with nothing but swamped shoes and a hot temper. I bought lunch at a bagel shop to get out of the rain and used their bathroom to swap my soggy shoes for dry socks and boots. I left a nice puddle of runoff from my backpack behind! 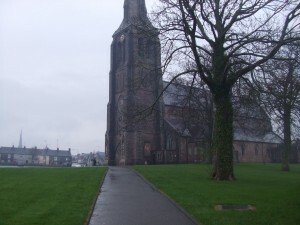 there, but I did stop in at several beautiful churches, and I window shopped my way through the city centre. By late afternoon, the rain had lifted completely to be replaced by a grey haze of smoke and condensation, and I wasn’t sorry to leave town on the evening bus. I was sorry to meet up with the monsoon again in Waterford. I should have stayed in the station until the Cork bus left, but I had a brilliant notion that I should see a little more of the city. As a result, my jeans were wet from mid-thigh on down, my boots filled with water, and, in case I was thirsty, the top compartment of my backpack became a rainwater storage unit. I retreated to the station with my tail between my legs and made another trip to the bathroom, this time to pour the lake out of my backpack. My footwear was beyond help. So, my song for the weekend was “The Old Woman from Wexford.” She was a nasty piece of work, anyhow, but I privately believe that she didn’t attempt to murder her husband to make way for a new man; I think the Wexford weather drove her mad!